Streetglo Reflective motorcycle decals and stickers kits for all bikes. Great Motorcycle Decals for all bikers! Our motorcycle sticker kits and decals dress up your bike while adding substantial night time reflectivity to your ride! Reflective Motorcycle Decals and Graphics can save your life! 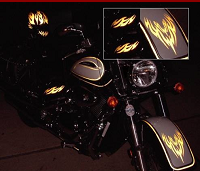 Nothing dresses up your bike like our reflective motorcycle decal kits! Our Motorcycle Sticker packages are the ideal ideal dress-up item for your bike. Each decal is precision cut and ready to install. Our Motorcycle Stickers are available in many bright reflective colors. your Harley Davidson, Yamaha, Suzuki or Kawasaki. Now receive 2 additional matching graphics free! You get a complete motorcycle decal kit including 3 primary graphics shown in outlined box above plus + 2 additional smaller trim graphics FREE!